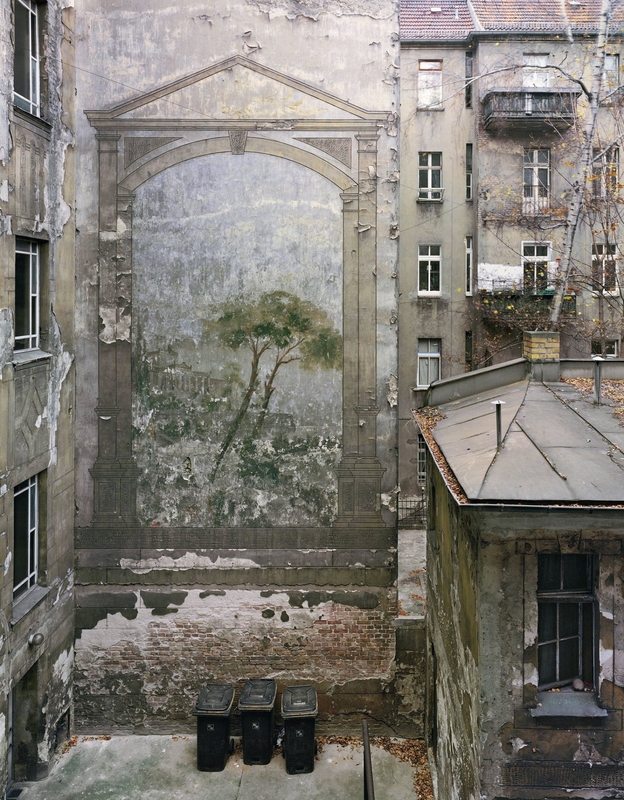 Ever since completing his studies at the Academy of Fine Arts Leipzig and his thesis project with Arno Fischer, entitled “Hufelandstrasse, 1055 Berlin” (1987), Zimmermann has been taking photographs with a large-format camera. For over twenty years he has been traveling with this heavy device to places such as Berlin, Leipzig, Dresden, and Warsaw, searching for traces of his own history written on these immense walls marking the end of a block of buildings or an empty lot: advertisements from the pre- and postwar eras, make-shift repairs, graffiti from the 1990s, contemporary restorations, or all of these things combined. Some walls are covered with grass and ivy, and trees have planted themselves in front of them and at some point grew higher than the building. Ignored or unnoticed by most, these remnants of destruction sometimes have the appearance of abstract paintings.